This elegant yet complex, medium-bodied Pinot noir (from the lesser-known east side of the Willamette River) opens up immediately with ripe red cherries and raspberries. Keep swirling and discover layers of tobacco, rose petals and mint will come through. Slightly savory notes balance out the sweet, red fruit and the peppery finish adds an element of interest that persists long and pleasurably in the mouth. This is a classic Oregon Pinot Noir; pair this wine with cedar-plank salmon or try it with coffee-crusted pork tenderloin. 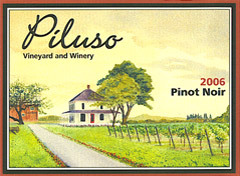 Read more about Piluso Vineyards at Sip With Me.